1. 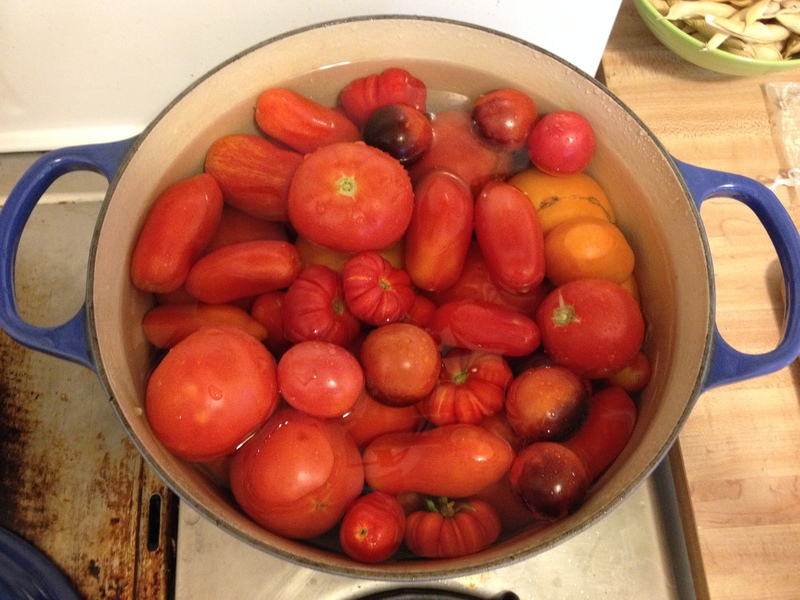 Fill up a large pot with clean, whole tomatoes. I use a 5 1/5 quart pot. Fill with just enough water to cover the tomatoes. Bring to a boil. 2. As soon as the water starts to boil, turn the heat off and let cool for a while. 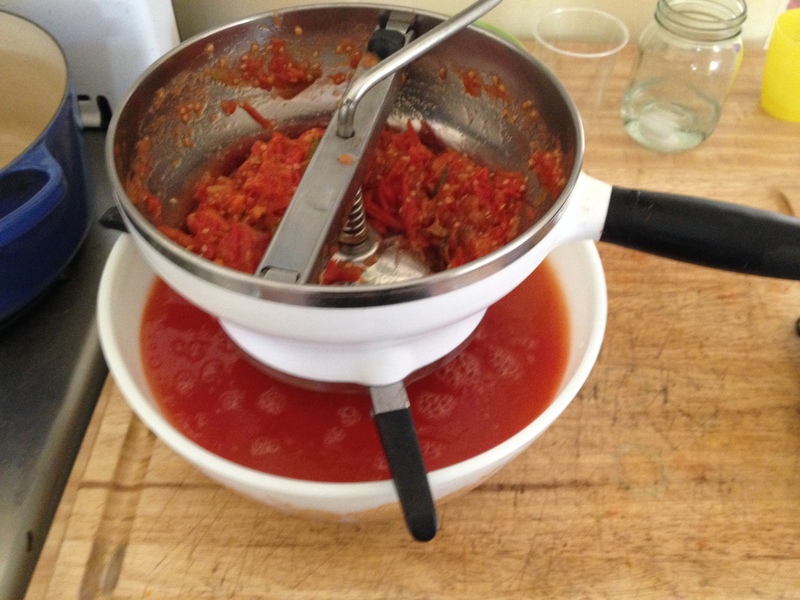 After the tomatoes are cooled pass them through a food mill. I use the finest setting so that few seeds make it through. 3. Return the tomato liquid back to the pot. Add salt and sugar to taste. Remember you can always add more later. I usually add about 1 1/2 teaspoons of salt and 1 tablespoon of sugar when beginning with a full pot of tomatoes. Bring to a simmer and cook down until you reach your desired consistency. 4. Let cool and then fill containers for freezing. Don’t forget to label your containers and include the date. 5. 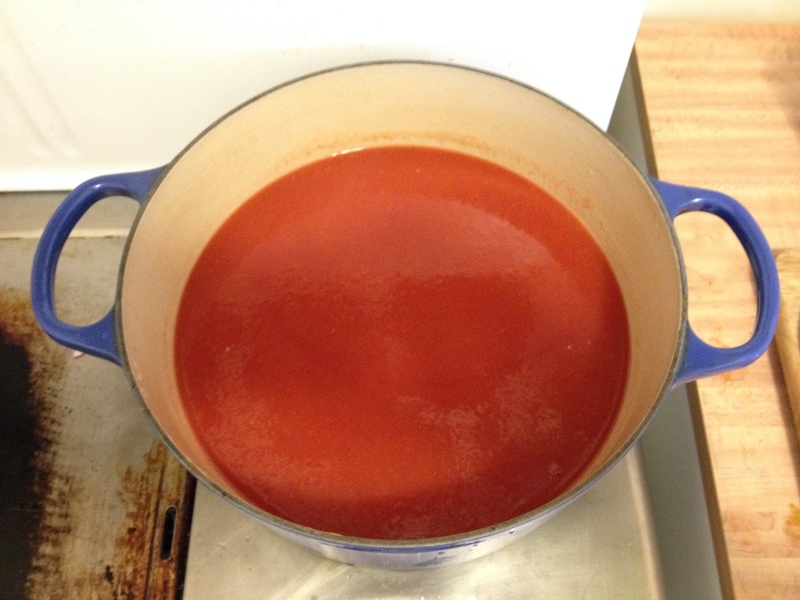 Make a note of how much tomato sauce you made (something I did not do). This way you will know when you’ve made enough (or too much) to take you through until next summer. Don’t you just love it? 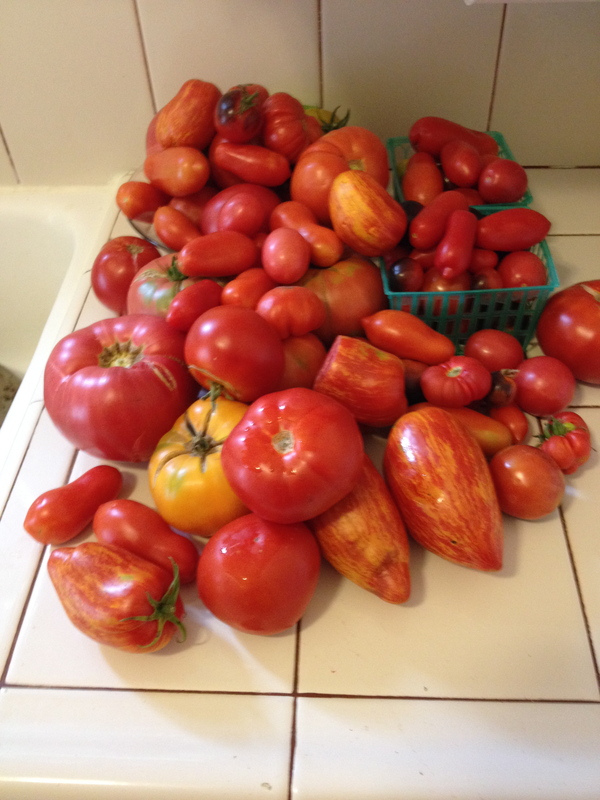 I am returning home after 5 days away and expect to find dozens of tomatoes that need to be eaten or preserved! How do you preserve your tomatoes? Such a good idea! I’m sitting on 6 lbs right now (not nearly as much as you) and I just love the idea of making something so basic that can be morphed to your hearts content at a later date. Thanks! It is so easy too. And see below comment for an even faster way to preserve you tomato harvest. Thanks for this! I’ve only ever washed and frozen (to make sauce later) but I don’t often have the time to make the sauce when I need to and end up reaching for that can opener…this looks fast enough (the hands on portion anyway) that it will help a ton. I am the same way. I like having the base sauce already made so I can just pull it out when needed. I rarely have time to make sauce from whole tomatoes when I am preparing dinner. 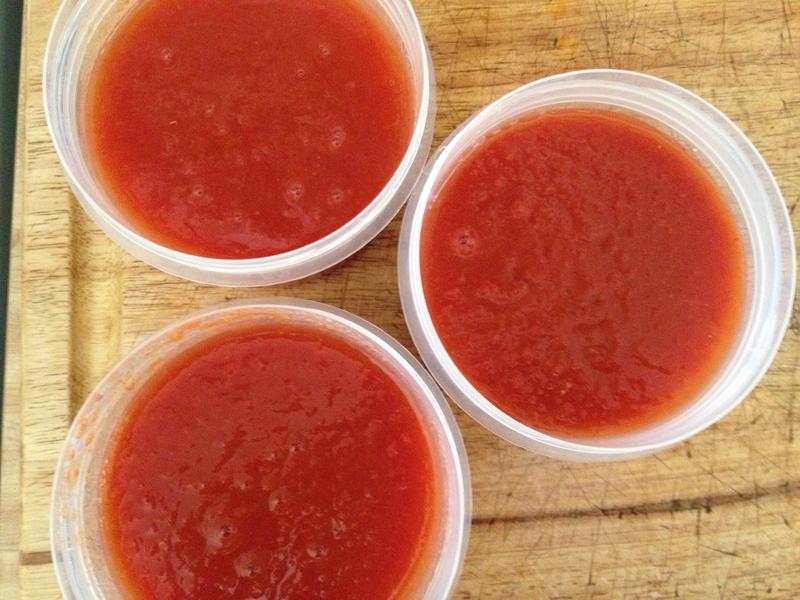 Toward the end of tomato season I do get burned out on making sauce and end up freezing some tomatoes whole.